When our daughter Olivia was born, my wife Maria and I were shocked to learn that she only had three toes on her right foot and a fairly obvious ankle deformity. Without any prior knowledge of this condition, we were advised by the on-call orthopedic surgeon in the hospital that she believed Olivia had a condition called Fibular Hemimelia, in which the fibula bone was absent in the lower leg. She strongly advised us against looking up Olivia’s condition on the internet, stating that the most common treatment would be amputation and fitment of a prosthetic limb. We saw the same doctor again when Olivia was three months old. She mentioned that in lieu of amputating, lengthening of the tibia was an option to combat the inevitable leg length discrepancy. This doctor, however, had no plan or suitable method to treat the ankle deformity. We heard of Dr. Paley through a family member and sought a second opinion when Olivia was only four months old. Before we even met Dr. Paley, Maria and I knew that we had come to the right doctor. While waiting in the office for our appointment, we met numerous other families, coming from around the world, who relayed their tales of how Dr. Paley had changed their lives for the better. Upon meeting him, Dr. Paley immediately made us feel at ease. He described the treatment plan that he stated would correct both her leg length discrepancy and her ankle deformity. The plan that he described wasn’t conjecture or experimental medicine; it was based on other procedures that he had already successfully completed with positive results. Beyond the treatment plan, Dr. Paley further calmed our nerves during the appointment by patiently answering every question we thought up, without regard for the length of the appointment. He further impressed us with his accessibility by remaining available for further questions by either email or telephone whenever we had the need. We were sold. In July 2009, when Olivia was only 18 months old, we nervously boarded a plane and moved from northern Virginia to West Palm Beach for treatment at the newly opened Paley Advanced Limb Lengthening Institute on the grounds of St. Mary’s Hospital. 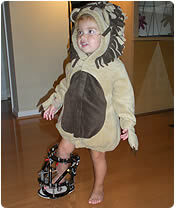 In the surgery, Dr. Paley placed an external fixator onto Olivia’s tibia and corrected the ankle deformity using a technique called the Super Ankle Procedure that he developed. The surgery was successful and went as Dr. Paley explained it would. In fact, everything about the entire experience went exactly as he explained it would. Due to the enormous size of the fixator compared to her little body, Olivia demonstrated her sheer will despite our greatest skepticism and began walking only seven days after surgery. We followed Dr. Paley’s treatment plan and rigorous physical therapy plan for the duration of the lengthening process before returning home. The fixator was removed five-and-a-half months later and replaced with a cast. After the removal surgery, Dr. Paley reported that Olivia achieved textbook perfect results throughout this procedure. Maria and I prefer to believe that Dr. Paley’s extraordinary skills are the reason that Olivia has had such positive results. Two months after the fixator was removed, Olivia is thriving. Today she runs, jumps, climbs, and acts just like most two-year-olds who do not have her condition. And now, for the first time in her life, she has two legs that are the same length. The full experience of being a patient of Dr. Paley is not solely about his precision as a surgeon, or his work as a tireless researcher and a ground-breaking medical pioneer. These descriptors would be incomplete without also describing the relationships that he develops with his patients and their families. Dr. Paley is dedicated to his patients beyond the operating room. He is committed to being the supreme advocate for his patients at all cost. Over the course of our treatment, there was no request, too great or too little, for Dr. Paley to become involved in to seek a positive resolution. For these things, my family and I are forever in Dr. Paley’s debt.